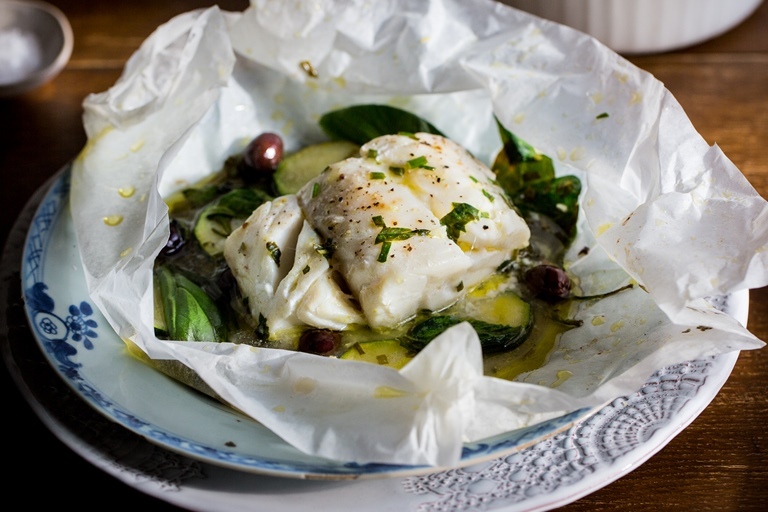 Louise Robinson serves Skrei en papillote by encasing each fillet in its own parchment parcel along with a fragrant mixture of olives, spinach, courgette and herbs. 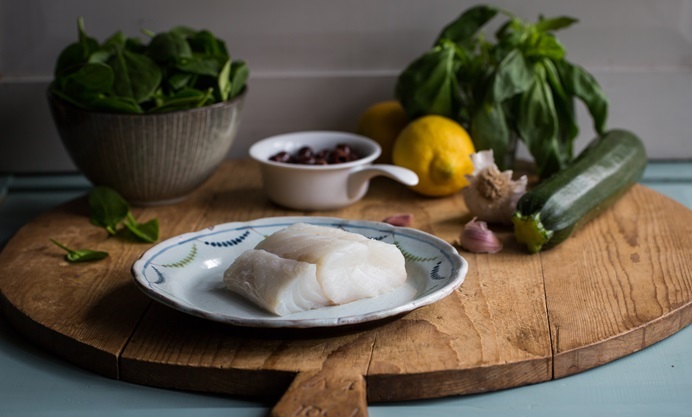 Perfect for a midweek meal, healthy lunch, or even a dinner party, this Skrei dish can assembled in a matter of minutes and looks fantastic when served in its paper parcel. 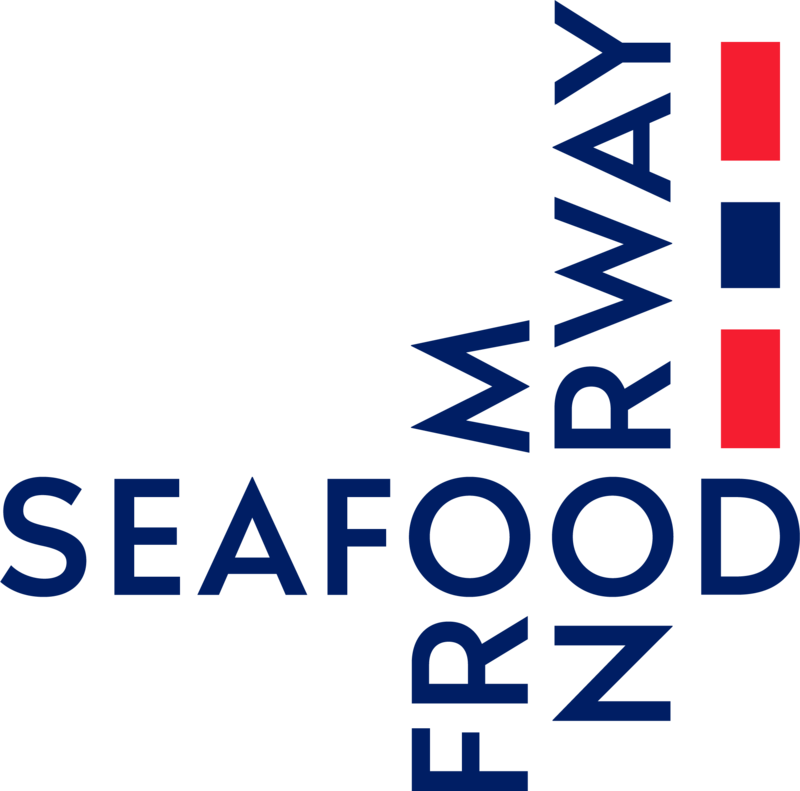 Norway has a long standing reputation for having some of the finest seafood in the world. Skrei, named after an old Norse word meaning ‘wanderer’, is a truly exceptional cod found in the wild coastal waters of Norway’s far north. In the past, years of overfishing have made those who are environmentally conscious avoid cod, including me. 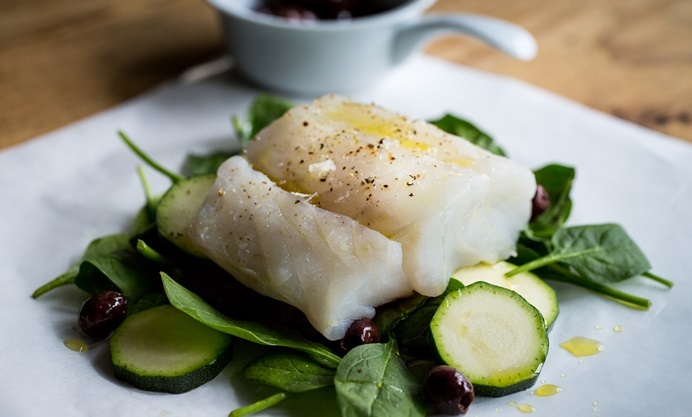 Skrei is not only possibly the best cod you are ever likely to taste, it can also be enjoyed guilt-free. Norway’s impeccable sustainability standards ensure that the Skrei is only caught during a very short and strictly controlled fishing season between January and April. 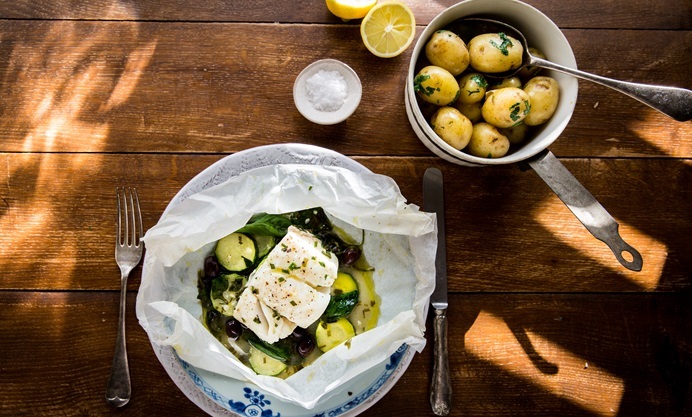 Despite the exotic name of this dish (‘en papillote’ is just French for ‘in parchment’) this is a quick and easy midweek meal. Little parchment parcels are filled with fish which steams gently on a bed of vegetables, allowing all of the flavours to intermingle. Although simple, this dish is certainly impressive enough to serve to impromptu guests. I think there is something especially appealing about unwrapping your own parcel at the table and releasing the wonderful aroma of sweet basil and herbs. The only accompaniment needed is a bowl of steamed new potatoes with a little butter and sprinkling of chopped parsley.